Movie fans with a particular fondness for the Film Noir genre will be familiar with the type of jazz-influenced orchestral scores that have inspired Sonokinetic’s Noir. In particular, the product’s publicity names Bernard Herrmann, Michel Legrand, Gil Evans, Miles Davies and Henry Mancini as its influences, although how their styles are combined in Noir is left unclear. What is clear, however, is that Noir isn’t a typical note-for-note instrument where, for example, a C crotchet played on the keyboard results in a C crotchet played on the selected instrument or ensemble patch. Instead, it provides performed phrases that seamlessly fit together, and these can be combined and edited, to a certain extent, to form greater compositions. I’m not sure how many hours Noir took to download, but I set it in action in the afternoon and it finished some time during the early hours the next morning! Once the RAR files were extracted, I was left with a massive 69.4GB folder of samples. To create the library, Sonokinetic’s engineers recorded a 50-piece string section, 12 woodwind players and a 10-strong brass ensemble. They also made solo instrument recordings of clarinet, muted trumpet, flugelhorn, tenor saxophone and piano, and both these and the orchestral sections were captured using close and wide mic positions, as well as with a Decca Tree setup and a ‘far’ position located on the venue’s balcony. 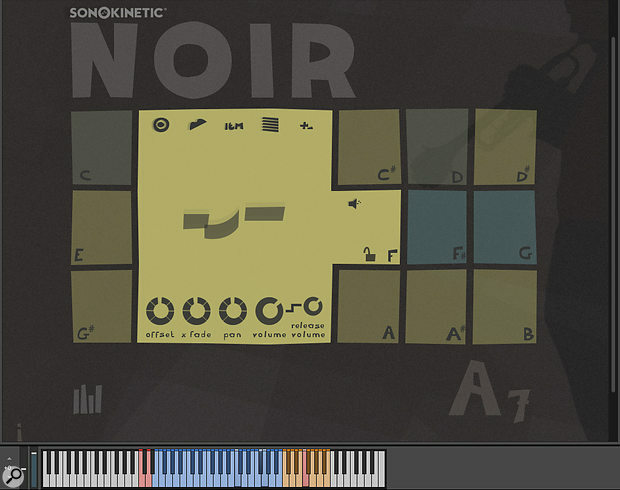 The ensemble recordings make up Noir’s Sections interface, while the solo instruments are accessed in a separate (and slightly simpler), interface called Solos. One way of working is to use the solo instruments for lead line work over the top of arrangements made using the sections, although it is also possible to drag MIDI score data from the Sections pages into the host DAW so that those parts become playable with third-party library instruments. By clicking on the little speaker icon in the phrase menu pages, the user is able to hear the phrase before assigning it to a key. The first obstacle Noir’s purchasers face is getting to grips with the rather unusual interface design. Its Art Deco fonts and cryptic graphics give it a 2D collaged look, as was frequently used on old jazz posters, and this is very different from the three-dimensional rendering of instruments and control panels that are given to most Kontakt instruments. It takes a bit of getting used to, mainly because initially it’s hard to tell which jazzy shapes are part of the decorative design, and which ones are buttons that open control panels and menus. Far from being an oversight by the designers, this appears to be deliberate. 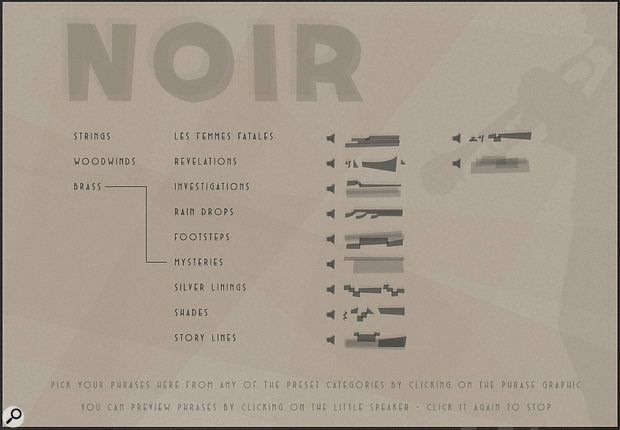 For example, clicking in the middle of the ‘O’ of the word Noir in the Sections interface randomises the instrument’s phrases and sections, but there’s no visual clue to suggest it’s a function. Perhaps this is a nod to the film noir genre, in which world-weary detectives struggle to solve mysteries! Despite the eccentric design, the only thing a user has to do to trigger phrases in the Sections interface is press the keys in the orange-coloured octave of Kontakt’s virtual keyboard. A player with enough free digits can trigger all 12 phrases together if they choose, although a more musical approach would be to use them sequentially, combining just a few at a time here and there. The way the phrases slot together is impressive, but to turn them from a set of looping motifs into a over-arching composition requires the application of some of Noir’s rather useful editing tools and controls. For example, a little lower on the keyboard there are 32 blue-coloured notes which trigger the instrument’s chord recognition system, thereby altering the phrases. In practice, the user plays major/minor triads and other chord variations in the blue section with their left hand, while selecting phrases with their right. This setup takes a bit of getting used to, but it’s impossible to trigger a bad sequence, so even composers with no formal music training can get started immediately. As for the phrases allocated to the 12 keys, they can be selected either by using the randomise button mentioned above, or individually from a set of menus, where a helpful audition function makes it possible to try them before committing to a decision. Further nuances can be built into a performance by adjusting the controls that apply to each of the keyboard notes. Particularly effective is the option to assign certain keys to the mod wheel, which is then used to fade them in and out, rather like a group bus fader on a mixer. Offsetting the start point of phrases is also possible, and they can even be set to play at half or double speed with just a simple button press. Add to this controls for pan, crossfade, harmonic shift and independent ‘sample release’ volume, and you have more options than hands to operate them. The Solos interface operates on the same principles; enabling users to play multiple instruments with their right hand and alter the chords with their left, but there are fewer editing tools because this time the focus is on selecting instruments and phrases. By default, the interface provides a selection of pianos, woodwind and brass instruments, but with one click a single instrument type can be assigned to the whole key set. It is also possible to randomise the phrases and instruments, or keep the instrument positions and randomise only the phrases. There are volume and pan controls for each instrument slot and favourites can be locked into a slot to protect them from being lost during the randomisation process. In the Solos interface the user can make the software select instruments and phrases at random, or they can click on one of the images at the bottom of the page to assign that particular instrument to all of the key slots. Common to both interfaces is the ability to choose whether playback is from a single mic position or a mix of two different ones, the options being Close, Wide, Decca and Far. The user is able to set the relative balance of their chosen two mic recordings simply by dragging a fader (designed to look like a jagged waveform) between one and the other. In terms of sample quality and phrase performance, Noir is very impressive indeed. Clearly the source instruments, musicians and recording venue must have been absolutely top notch. The lush orchestral feel of those old film scores that inspired Noir is captured amazingly well, and words like effortless, fluid, rich and beautiful spring to mind. Given its price, Noir is probably only going to attract composers who really do need to produce a lot of film noir- and jazz-inspired music, and I’d suggest that it is better suited to relatively short phrase-based work than long, evolving compositions. Nevertheless, this instrument oozes quality, so anything its users come up with will immediately sound perfectly recorded and performed. The way the phrases fit together makes it impossible to put a foot wrong. Plenty of phrase manipulation tools. The unusual interface design takes a bit of getting used to. Working with phrases has its limitations. It takes up a lot of HD space. Noir’s wonderfully performed and recorded phrases wouldn’t sound out of place in a vintage film score, and they fit together so effortlessly that a user can’t fail to come up with pieces that sound professional and polished. Nevertheless, working with pre-configured phrases has its limitations.